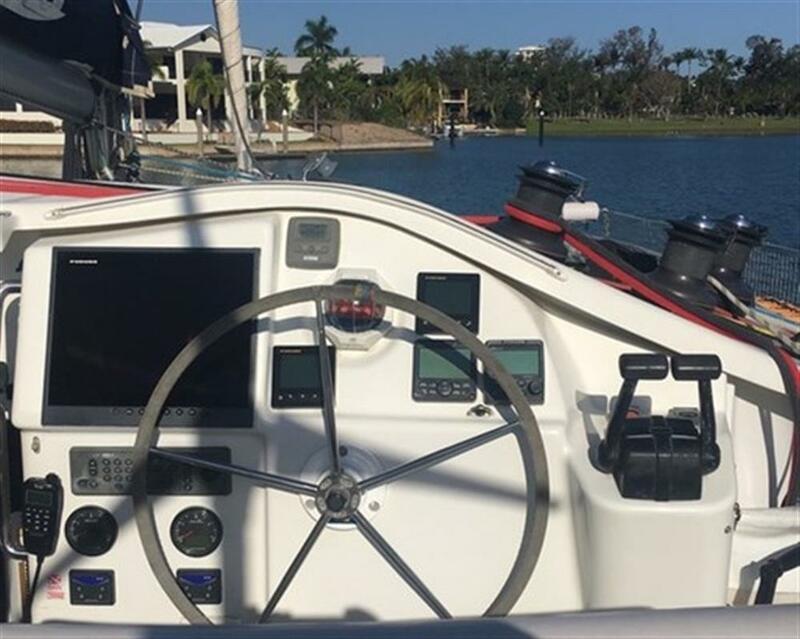 Electronic tools for navigation: AIS, Rudder angle indicator, Radar Antenna (FURUNO), Odometer (FURUNO), DSC vhf (ICOM), Depth Sounder (FURUNO), GPS (FURUNO), Log (FURUNO), 2 Autopilot (FURUNO + SIMRAD), Chartplotter (FURUNO), Radar (FURUNO), SSB (ICOM). Staging and technical: Engine Alarm, Anchor (ROCNA 33 kg), Water pressure pump, 8 Batteries (1.400 Ah), Battery charger (VICTRON 120 A), Deck Shower, Tender Crane, Auxiliary Engine (15 hp), 4 Pannelli Solari (à 100 W), Gangway, Automatic Bilge Pump, Manual Bilge Pump, Shorepower connector, Electric Windlass (1.500 W), swimming ladder, cockpit table, Tender, 4 Winch (ST), Windex. Domestic Facilities onboard: Warm Water System, 12V Outlets, 220V Outlets, 4 Manual Toilet. Security equipment: Safety equipment within 50 miles. Entertainment: Speakers, Hi-Fi. Sails accessories: Spi Equipment, Jib Furling System (FACNOR), Ball bearing slider mainsail, Lazy Bag, Lazy Jack, Mainsheet traveller. Kitchen and appliances: Galley, Burner, Icebox.